Featured Publicist: Frazier Public Relations - Radio Guest List.com - How to Get Radio Interviews and Find Podcast Guests! Are you looking for a smart public relations program that gets results? Are you an author who needs help promoting your book, getting press and interviews, film options, or securing broader distribution? We have several feature films being produced for our authors. Click to email SherryFrazier@FrazierPublicRelations.com or call us at 540-338-1545. If you’re looking for publicity help, please consider this sponsor to support our free service! See our Featured and Recommended Publicists & PR Firms here. 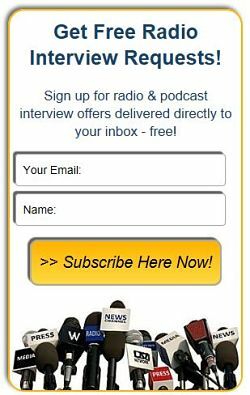 Would you like to be interviewed on radio and podcasts? Learn about our easy advertising services here.